Spring is fast approaching and I am anxiously waiting for the tulips to bloom. For about two decades now, city municipality in Istanbul is dedicated to turn Istanbul into a large tulip garden. Starting in mid March till about end of June we see parade of different kinds of tulips, all shapes and colors cheerfully color the streets, parks, public areas. Visitors seeing these tulips immediately say, “tulips from Holland”. That moment, my heart sinks and as a guide as start telling the story, after all it is my job. Origin of tulips and the Turks are the same, Central Asia. As Turks immigrated to Asia Minor from the 10th century on, they carried their beloved tulip bulbs with them, planting it in their new homeland. It was not only known as the Turkish flower, but also the holy flower due to it’s name. The original name for tulip in Turkish, lale, comes from Persian (Turks went thru what was Persia on their way from Central Asia to Asia Minor), and it is called “laleh”. In Arabic “laleh” and Allah are written with exactly same letters making the flower the holy one. This is why in traditional decoration of mosques, it has been the most popular figure. The first tulipomania of the world was under the Ottomans in Istanbul in the 16th century, during the reign of Suleiman the Magnificent. Tulips became the symbol for power and wealth becoming a status symbol. 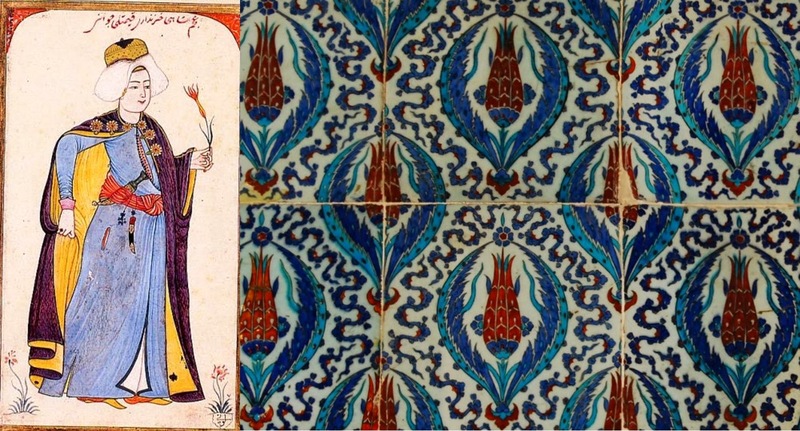 The flower even gave it’s name to the period considered to be the zenith of Ottoman wealth, the Tulip Era. The rare bulbs costed fortunes. The Ottomans had strict laws to regulate cultivation and trade of bulbs, they were not permitted to be taken our of the country. 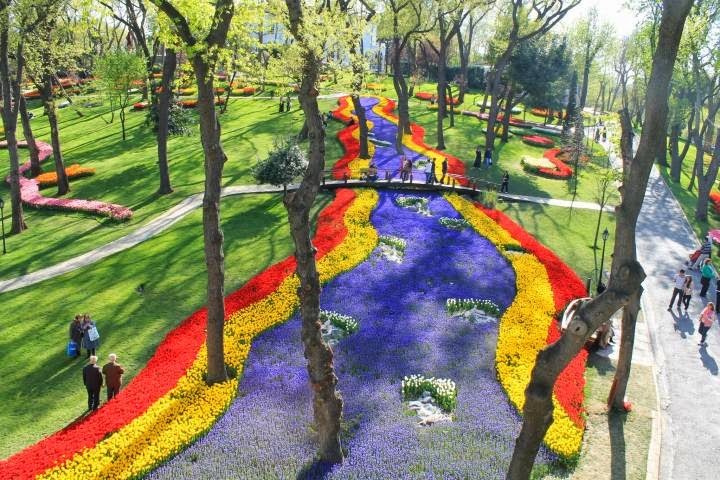 Emirgan Park, north of the city center is the main destination during spring for tulips. According to the commonly accepted story, a Flemish scientist growing plants for medicinal purposes got a hold of tulip bulbs thru a European ambassador in the Ottoman court and took it to Holland. The story continues saying that this scientist was so selfish that he did not want to share or sell his bulbs and eventually his garden was raided and flowers finally were freed and spread. Weather this was true or not remains unknown, but we know that tulip bulbs started appearing in Europe and giving way to a frenzy soon. Bulbs were so valuable that they were even used as an exchange medium in trade. The Yellow Pavilion in Emirgan Park, one of the Ottoman mansions serving as a restaurant. Skyscrapers behind the park mark Istanbul’s financial district. After the decline of Ottomans started, growing tulips became last of their worries and this wonderful flower was forgotten in Turkey. Meanwhile, the Dutch were creating miracles in preserving and growing it and cleverly making a huge industry out of it! My interest in tulips is not because the season is approaching, but because it is also my name in Turkish, Lale. Tulips grow best in areas that are cold in the winter and higher elevation, such as their homeland, the Central Asia. I hope this will be noticed by greater number of people soon so we can get to see tulips across central Turkey, which is cold in winter with higher elevation. Emirgan Park is the place for newly engaged and wed as a photo op. This photo shows a newly engaged couple, she is wearing a typical dress popularly worn by more conservatives nowadays, hence her hair is covered. It is delightful to enjoy tulips in Istanbul. 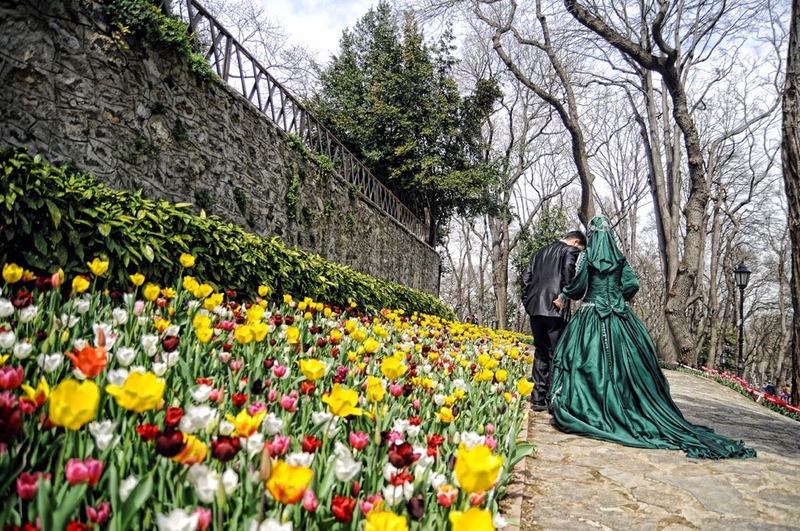 Best tulip watching can be done in the historic Emirgan Park north of the city, along the Bosphorus. It is one of the largest public parks of the city with over 100 acres and there are jogging tracks, playgrounds and historical Ottoman mansions serving as cafes and restaurants. Emirgan park is a small scale arboretum, it has over 120 species.